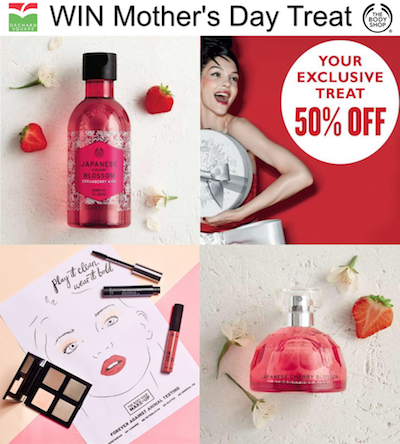 Treat yourself or your lovely mum to a fantastic treat from The Body Shop this Mother’s Day. Simply like and share our competition post and enter to win a Body Shop prize bundle; the new Japanese Cherry Blossom Strawberry Kiss 60ml eau de toilette and matching shower gel, a free makeover and a 50% off voucher for The Body Shop. Prize must be collected from The Body Shop Orchard Square and is only valid at this store. Competition closes Friday 9 March 2018.